This is the piece that Denise gave Camilla. The Fuchsia color is amazingly fun and the look and feel of the faux leather make it hard to believe it's not real. It has not been the warmest of summers at the beach this year. 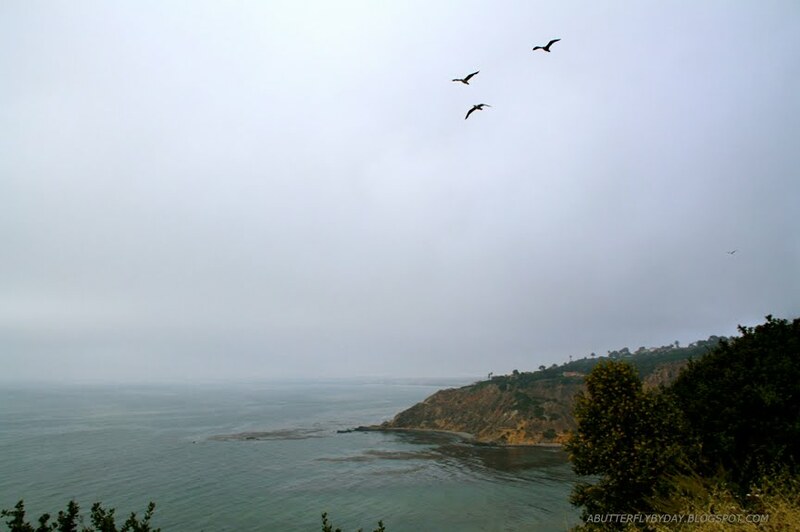 Lately most days are in the high 60's with fog and marine layer. Just one mile inland its 10 degrees warmer and sunny. When we finally did this shoot it was sunny but only in the mid sixties and the end of the day. We were hoping to get a great sunset but Camilla was getting too cold. 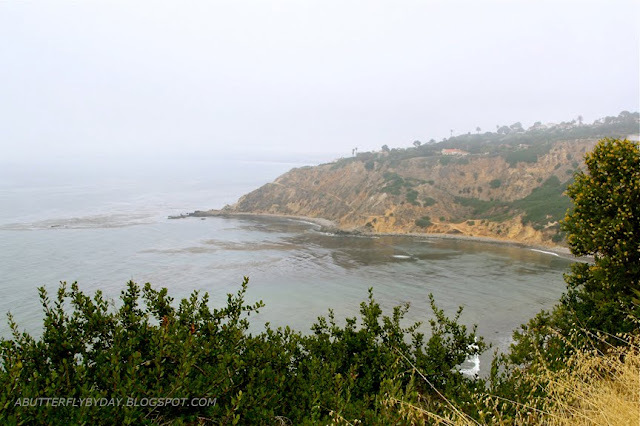 We decided to go up to Palos Verdes point yesterday because although the day was gloomy, it looked like we were going to get a bit of end of the day sun. We were wrong about the sun but the the view is always amazing and it can give you a total attitude adjustment. The location is just the other side of Bluff Cove. 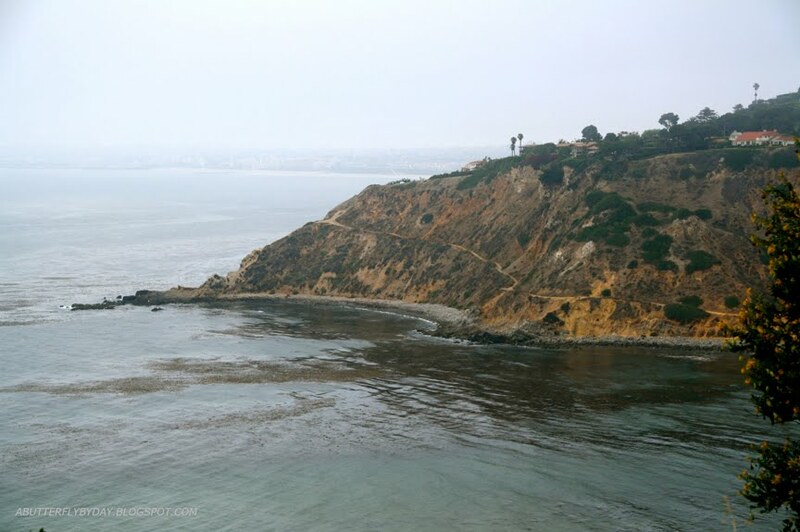 In the last picture you can see the trail that leads down to the beach. Surfers trek down the long dirt path to catch waves that break further out than the local beaches. Camilla is wearing a vintage 1960's bathing suit in the last pictures, a la Sandra Dee. Vintage Levis 501's and Jeffrey Campbell Nation Boots in the first set of Photos. Necklaces are Camilla's favorite Dali Lama and her St Christopher who protects surfers in the ocean. Click the link below and see who else is honored because there are a lot of great blogs to see. i really like that jacket soo pink and cute! and cool link--how neat that you two are recognized!--i will check some others out. really nice jacket on a beautiful day! Oh my lord, ur blog is awesome <3 love it ! love love lovee this! Im obsessed with the bathingsuit. p.s. check out my blog for the posted interview of you two! PINK PINK PINK!!!! OUR Favourite color!!!! You loook sooo gorgeous CAMILLA!!! Like a supermodel!!! Oh wow - these pictures are amazing. Love the jacket of course, but the suit is particularly eye catching. Superb. I love the jacket, is awesome!! We saw this on Stylecaster and love it so much - what great vintage finds, AMAZING!!! first congrats for gettin faux fur! second, the color is great and amazing on you!!! I love your jacket, and that it is vegan:) That swimsuit is incredible though and such pretty photos! I love the look of that polka dot crop and shorts, looks so chic and 1950s. lovely blog and welldone on that recongnisition from the link. Lovely colour for a jacket. Great outfit, love the jacket.